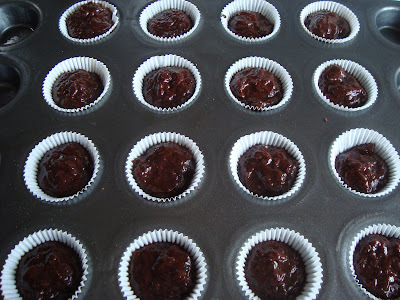 This week's Tuesdays With Dorie baking challenge is Dorie's Brownie Buttons, chosen by Jayma of Two Scientists Experimenting in the Kitchen (who has the recipe within her blog). I'm a fan of small bites whether they are sweet or savory so this recipe is great if you just need a little nibble of something sweet. The recipe doesn't make too many buttons, so pace yourself! The recipe starts out with a simple brownie batter made with flour, salt, butter, bittersweet chocolate, light brown sugar, vanilla extract and egg. An optional addition is orange zest mixed with some sugar. I included this when I made the recipe and boy, does that orange zest give the buttons a nice refreshing kick! All the ingredients are combined in a saucepan and portioned out into a mini muffin pan. The recipe yields sixteen (16) brownie buttons - not a whole mini muffin pan of 24... which I thought was an interesting proportion. After baking for a mere 14-16 minutes, these little guys cooled a bit before getting topped with some leftover cream cheese frosting I made for another recipe. The original recipe called for dipping the top of these buttons in melted white chocolate... but the cream cheese frosting was delicious all the same. Nice touch adding the cream cheese frosting. The swirls are perfect. Great job! Looks like a great recipe! Can't wait to try it. 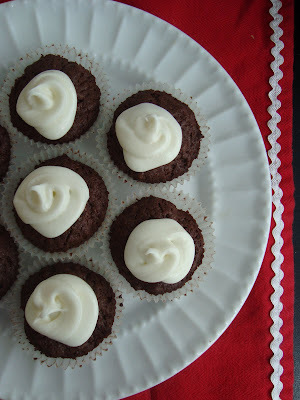 These look great with the cream cheese frosting! They look delicious, I need to bake these this weekend! Yum! Love love love cream cheese frosting. Especially with chocolate. 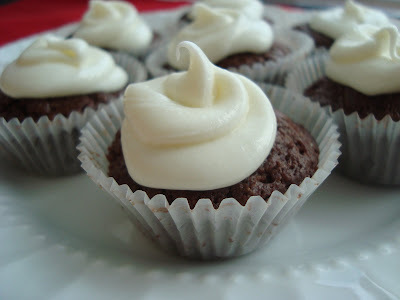 The dollops of cream cheese frosting looks really delish! I love cream cheese frosting! Those are really adorable with the dollop of icing - good choice the cream cheese.